Amy explains her method of stacked nylon screens for drying tomatoes in the sun. Amy Goldman says the first thing to remember is that plum tomato varieties far and away yield the best dried results. 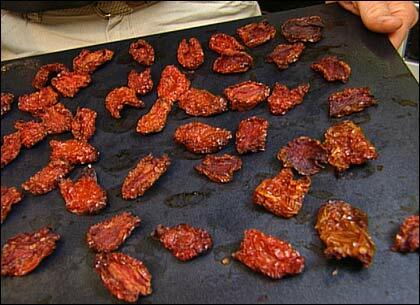 They are meaty and have very few seeds, and thus dry more quickly than other varieties while having great flavor. For all three methods of drying, simply slice off the top of the tomato, cut it in half, scoop out the seeds and proceed from there. 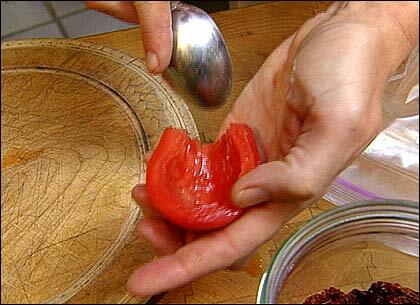 To dry plum tomatoes just cut them in half and scoop out the seeds. Amy uses simple wooden frames with nylon screens, stacked one on top of the other, to dry her tomatoes, harnessing the power of the sun. This outdoor method does call for a fairly dry climate, however. Eliminating moisture is key, as moisture encourages molds and other problems. To protect against morning dew, Amy covers the stack with a spun cloth at night or brings her stack of frames indoors. Oven-drying at very low heat, with a light drizzling of olive oil, is perhaps the tastiest method. Brush seeded and halved tomatoes lightly with olive oil. Place them on a baking sheet at extremely low heat  about 150 degrees  all day long (or at least 8 hours). Turn the tomatoes occasionally. To infuse dried tomatoes with wonderful flavor, you can layer them in a mason jar with olive oil, basil and garlic, and store in the refrigerator. These are especially good on sandwiches, in salads and on pizzas. 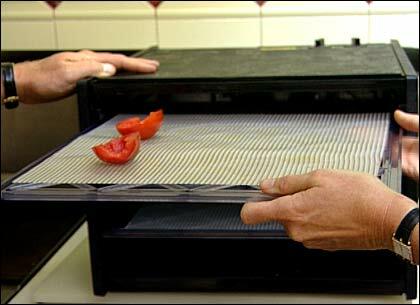 A variety of dehydrating machines are available and also work well with tomatoes. As models vary, you should follow the manufacturer's directions for drying. Tomatoes dehydrated using this method are often not quite as tasty but can be successfully stored in the freezer for up to a year, and can be easily reconstituted with a little soaking for use in cooking. Also see Amy Goldman's recipes for Sun-dried Tomato Crostini and an Onion and Sun-dried Tomato Tart in our Recipes section.